Molly strikes again with her spin on wines paired to Superheroes. Come taste these fantastic wines with us tomorrow! Oh, Peter Parker, you've had three different versions of your life played out onscreen (by Tobey Maguire, Andrew Garfield, and Tom Holland respectively) in 15 years! No one can quite nail you down, which is why you are certainly the also misunderstood grape, Riesling. People frequently cookie-cutter Riesling into one of two categories: either too dry or teeth-achingly sweet. But you and this Feinherb Riesling prove that you are both so much more. Both of you are steadfast in your determination to help people; Philip David Catoir, the 9th generation of the Catoir family to run their winery in Pfalz switched to all organic practices to help people and the land. Peter Parker, meanwhile, is a naive and positive force of energy who doesn't let his sad childhood and radioactive spider-bite get him down, and even though he could hide his abilities and live a normal life, he chooses to save world. This Riesling is as flexible and graceful as Peter's artistic movements across skyscrapers and is filled with bright peach and apricot notes that are as powerful as this teenager hero's geeky friendliness. But at the same time, this wine is filled with as much rocky minerality and stubborness as Spiderman! It's hard to picture Logan without thinking of bar fights, motorcycles, and leather jackets. Wolverine, or Logan, is unapologetically a New World Chardonnay. He doesn't care if people are offended by his bold and full personality and, alike to Chardonnay, he is adaptable and can grow and live all over the world. (But, preferably somewhere where he can ride his bike) Scribe is from brothers Adam and Andrew Mariani, who grow this organic wine on huichica loam and volcanic soil; it is aged for 5 months in stainless steel and cement tanks with extended lees contact. Logan, despite his gruffness, vulgarity, and insistence that he work alone, always seems to find himself saving lost people, like Laura and Rogue. Logan also has a tender spot for caring for elderly Charles Xavier. He is as warm as this Chardonnay with its vanilla, baked honey and pineapple notes, with a balanced dryness that is as on-point as Wolverine's sense of humor. We are where we come from to an extent, whether one is a superhero or a wine. Even when walking around London under the guise of Diana Prince, there is something wild and unmistakable about Wonder Woman; its similar to when drinking a wine and identifying that pulsating grittiness that signifies that its homeland is Mt. Etna, one of the most active volcanoes in the world! Hundreds of thousands of years ago myths were created to explain the incomprehensible - from creation to natural disasters - and so it seemed fitting to have the daughter of characters based off Greek Mythology's Queen Hippolyta and Zeus paired to a wine from such special terrain. This white wine is from the Carricante grape variety is from a father and son team, Giovanni and Alessandro Valenti, who grew this wine on black volcanic soil. It was aged for 8 months in stainless steel and for 3 months in bottle. Like Wonder Woman, it is graceful and direct with notes of honeydew melon, peach, and white flowers. Can anyone really picture Bruce Wayne ordering any wine off the menu that isn't Italian? His palate matches his Lamborghini and closet full of Armani suits. Both Bruce and Batman need a serious wine that is just as brooding and mysterious as them. This red comes from the Sangiovese grape variety and is grown by a winemaker who is as no-nonsense as the dependable and droll butler, Alfred Pennyworth. Dora Forsoni has been working on her family's land in Montepulciano since 1968 but only more recently has begun a winery with her partner Patrizia Castiglioni. The grapes are destemmed but they purposefully leave many whole berries intact. ; the fermentation is with native yeasts and is macerated in concrete; the wine is then aged in Slovenian oak for 3 years. This Sangiovese is dark and dirty with notes of leather, tobacco, and black cherry, and is an unfiltered natural beauty just like Batman, who is the only Superhero on this list who doesn't actually (GASP) have superpowers! All of his powers are through his gadgets, intelligence, and physical strength. To put it mildly, that is impressive, so he needs a wine that has just as much oommph. Decant this oommph-filled beauty for a while! 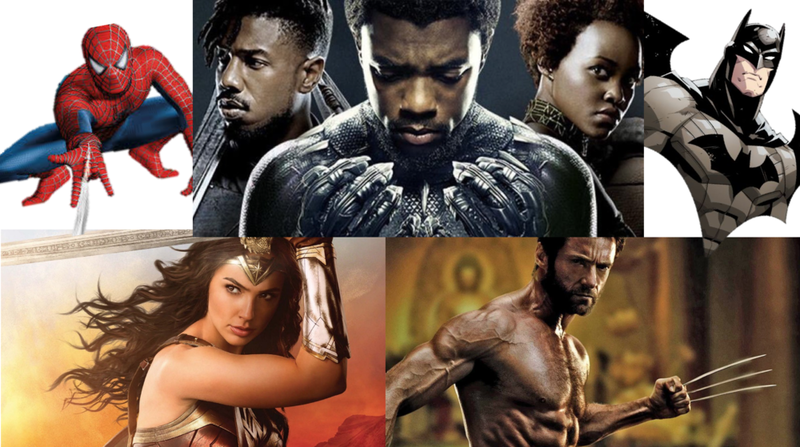 Unlike the others on this list, Black Panther isn't just a catchy name but an inherited title that can be challenged or lost. The Black Panther doesn't get into bar scuffles or chooses what villains to have a vendetta with; instead his purpose is to protect and serve the nation of Wakanda. T'Challa, the current Black Panther, has such a kickass team in Wakanda that he has to be an amazing blend of a wine. Elan, from superb female winemaker France Crispeels in the Languedoc, is a blend of Grenache, Carignan, and Syrah. This was grown on granite and gneiss soil and fermented in whole bunches to preserve the fruit and freshness. Like T'Challa, this blend is dexterous and sincere but it also has some of Suri's light humor in its baking spice notes. It deepens in the palate to Nakia's strong sense of justice and optimistic raspberry notes and then reaches Okoye with her structured sense of duty and plum.